It often seems like the winter holidays are synonymous with plates piled with high-calorie foods and desserts, along with the tons of leftovers saved for the next day. Sure, indulging in your favorite bites during a special day might be harmless, but keeping refrigerators loaded with goodies for an entire season could spell trouble for the whole family, especially young bellies. He offers tips to avoid overindulging during the most decadent time of year and alternatives to help sate both sweet and salty cravings, so saying "no" to second helpings and a handful of Grandma's cookies becomes a bit easier. These treats are perfect for small hands, but even grown-ups are sure to enjoy. Dessert doesn't get more darling than this. Ruby red strawberries contain fewer than 50 calories per cup, are low in fat and loaded with vitamin C, more than a medium orange. This treat is a festive way to help kids reach their daily fruit goals, and can be put together in just a few minutes. Whip a quarter cup of nonfat ricotta cheese with half a teaspoon of vanilla extract. Remove the leafy, green tops from a cup of strawberries and slice the pointed tip off each. Add a dollop of your mixture to the larger piece of strawberry and replace the "hat." Add a face to your fruit with two mini dark chocolate chips. Kids can also build the Santa hats themselves. Slice the fruit and let your young ones do the rest! This dessert contains about 100 calories, and that's more than 300 fewer calories than a standard slice of apple pie. These old-school sandwich rollups are a perfect pre-gathering snack, and even make a great last minute addition to the holiday spread. Or you can serve them as a post-holiday nibble, since these bite-sized rollups come together in minutes and utilize healthy leftovers, like turkey. The benefits of incorporating leftovers into other recipes are two-fold: You don't waste food, but you also don't eat the same monotonous meals day after day. To build this shareable treat, lay down an 8-inch whole wheat tortilla, spread on half of a ripe avocado, layer in three ounces of lean turkey breast, half a cup shredded lettuce and half a cup of sliced tomato and sprinkle with salt and pepper. Next roll up your wrap – burrito-style – and cut into 2-inch thick rounds. Half the wrap contains 207 filling calories. Salty and crunchy snacks, like pretzels and chips, can be tough for children to resist, especially when other partygoers are enjoying them. 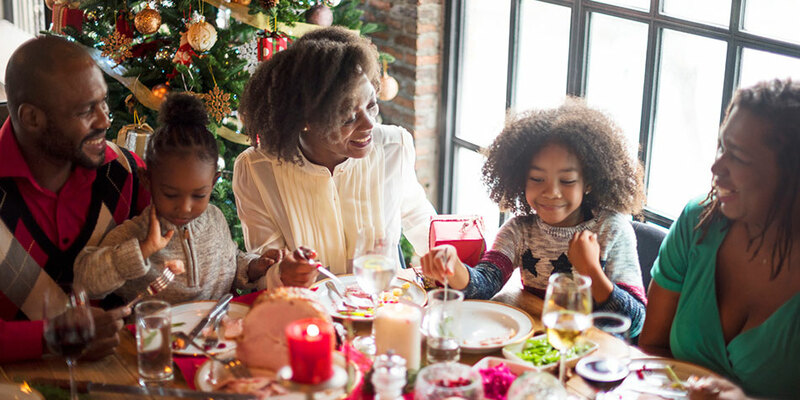 Instead of letting young ones go wild in the name of the holidays or restricting their consumption entirely, bring a lighter treat for your youngster and other health-conscious folks to nibble on. To make a lightened-up party mix, combine three cups of rice Chex cereal, a cup of unsalted peanuts, three cups of multigrain cereal O's and a packed cup of unsweetened raisins. A half-cup serving, which can be measured into a small bowl or cup for kids, contains 125 calories. The mix is more filling than the same serving of potato chips, and your young ones will be none the wiser. An apple, a recommended snack, contains just 95 calories and are available all year long. They're sweet, thanks to their natural sugars, and sure to please a child's taste buds. The best snacks for kids are fruits and vegetables. When holiday tables are loaded with cookies, brownies and cakes, kids are much less likely to reach for a piece of fruit. To entice young ones to get their recommended produce servings, slice an apple into wedges about one inch thick and dip one (or two) sections into melted dark chocolate. Sprinkle with a touch of unsweetened shredded coconut or chopped nuts or leave them plain. Craving a chocolate dessert? Don't reach for the devil's food cake – which can pack 290 calories per slice – just yet. There are other ways to indulge your cravings. Rather than deny yourself, choose a healthier alternative. Instead, whip up your own dark chocolate bark, adorned with toppings like shredded and unsweetened coconut flakes, pistachios and unsweetened, dried fruits. Spread the love by melting 16 ounces of dark chocolate over a double boiler, stirring constantly to prevent burning. Line a baking sheet or other wide, flat dish with parchment paper and spread your melted chocolate into a thin, even layer. Next, get the kids involved! Chop and sprinkle pumpkin seeds, dried goji berries and coconut flakes on top or use a handful of dried blueberries and coconut shreds. Your festive add-ons will add a few more calories so spread them evenly and don't get too heavy handed. Disclaimer: Content is reviewed regularly and is updated when new and relevant evidence is made available. This information is neither intended nor implied to be a substitute for professional medical advice. Always seek the advice of your physician or other qualified health provider prior to starting any new treatment or with questions regarding a medical condition. From thawing your bird to gobbling it down at the table, these tips will help you enjoy a safe and healthy Thanksgiving.